This book provides a new point of departure for thinking critically and creatively about international borders and the perceived need to defend them, adopting an innovative ‘preferred future’ methodology. 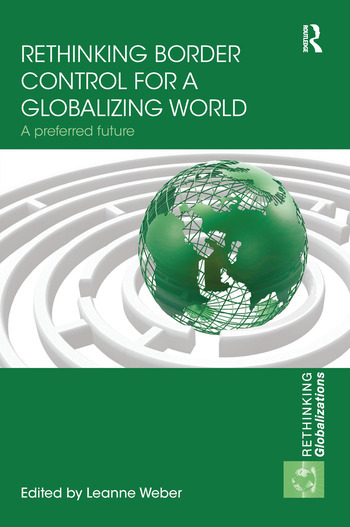 The authors critically examine a range of ‘border domains’ including law, citizenship, governance, morality, security, economy, culture and civil society, which provide the means and justification for contemporary border controls, and identify early signs that the dynamics of sovereignty and borders are being fundamentally transformed under conditions of neoliberal globalization. The goal is to locate potential pathways towards the preferred future of relaxed borders, and provide a foundation for a progressive politics dedicated to moving beyond mere critique of the harm and inequity of border controls and capable of envisaging a differently bordered world. This book will be of considerable interest to students of border studies, migration, criminology, peacemaking, critical security studies and IR in general. Leanne Weber is Australian Research Council Future Fellow at the School of Social Sciences at Monash University, Melbourne, Australia. She is the author of Policing Non Citizens (2013) and co-author of Crime, Justice and Human Rights (2014, with Elaine Fishwick and Marinella Marmo) and Globalization and Borders: Death at the Global Frontier (2011, with Sharon Pickering).